Waste King Vs InSinkErator - Which is a better garbage disposal brand? Loaded with advanced features, exceptional functionality and top-notch quality, garbage disposals are indeed an essential helping hand that takes care of food wastes in no time. 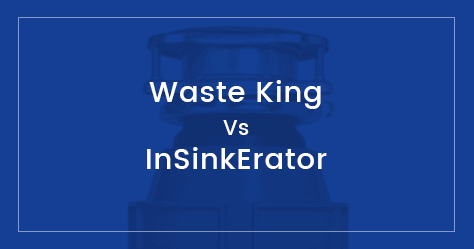 While there are innumerable options to choose from, however, the decision often comes down to the two prominent brands of the industry- “InSinkErator” or “Waste King”? Both are regarded to be the leaders of disposal units, offering magnificent models at a phenomenal value. But, when you have to choose one, which one would be ideal? Read on to find out more! Established in 1927. InSinkErator is one of the oldest garbage disposer manufacturing company. It was founded by John W. Hammes, who is credited for the invention of in-sink disposal, in which a machine shreds and grinds food wastes that would have otherwise blocked the drainpipes. He took over ten years to enhance the design and the finally went into commercial business by selling the disposer. Later in 1958 the company was acquired by Emerson Appliance Solutions and ever since then InSinkErator became a household name. At present, the company provides two lines of disposers namely Evolution & Badger series. Out of the two, badger is the classic range that has been in the market for a long period of time, while Evolution is a modern and reinvented range of the same. Part of the renowned Anaheim Manufacturing Group ( a division of Moen Inc.), Waste King Garbage Disposers have known to be one of the finest appliances for managing food wastes. From the patent Vortex technology to permanent magnet motor, this brand has brought some of the noticeable developments to the disposer units. Like InSinkErator, there are two system of products delivered by the company and they are 3 Bolt Mount System and EZ Mount System. Further, there are models of different price ranges of power, ensuring that you are able to discover the best one without any complications. Both the brands enable their disposers with powerful motors. The motors of Waste King are high-speed ones which usually run in the 2600-2800 RPM range while InSinkErator uses slower ones which run below 2000 RPM. Also, the motors of Waste King are permanent magnet type while those of InSinkErator are induction type. Both have their own advantages and disadvantages. In any case, the performance of both disposals are comparable and they do their jobs. The Evolution series launched by InSinkErator brings a one of a kind technology, where the garbage is shredded within the disposal unit. New variants have multiple grinding stages, where the first disposal grinds the waste and then transports it into another filter where it is ground again and this eliminates the chance of having any large chunks of leftovers. If the waste is not small then stuck inside and this would ultimately affect the drainage system. Different stages of grinding are without a doubt a smart and innovative addition to the series, while Waste King has not incorporated any such technology yet. But since Waste Kings garbage disposals are high-speed they tend to jam less making this technology unnecessary for them in practice. If you are worried about the small space of your sink then both Waste King and InSinkErator would be equally good. As they are loved for their easy to fit design and compact structure that makes it compatible with almost every kitchen. In fact, if the bottom area of the sink is too congested then you must consider opting for the small size models. Remember: bigger versions have large grinding space and this is the reason why some of the large variants of Waste King are preferred for the same. The grinding chambers of all Waste King units are crafted from corrosion proof plastic while the top-end InSinkErator products are created from sturdy metals. Both have an excellent design and robustness but if it’s about strength and aesthetics then InSinkErator wins the case. A common problem that most of the users have with InSinkErator is: it does not include a power chord along with it. So, after purchasing the unit you still have to buy the chord in order to operate the appliance. Though it’s not that difficult to set up, still the added expenses of power chord can be an issue. This why people tend to prefer those that have pre-installed power chords and this is where Waste King makes its way. Each and every model manufactured by Waste King is equipped with pre-installed power chords! The older versions of both the brands were extremely noisy. However, this is now transformed for good with the next generation of technology that shields the grind and reduces noise to a greater extent. For this, InSinkErator uses a sound seal, while Waste King has a foam placed around the chamber for absorption of sound. The InSinkErator generally does a better job at noise insulation than Waste King atleast in the case of high-end models. Waste King features a lifetime warranty over its disposers, while for InSinkErator it does not exceed for more than 8 years. This allows consumers to have their garbage disposal with a peace of mind. So, due to the longest warranty period, Waste King clearly wins over InSinkErator in this regard. The splash guards of Waste King disposals are removable making it easier to clean the insides of the garbage disposer while those of the InSinkErator products are not. When happy with all the features of the disposer, the last and the most important deciding factor is the cost of the unit. Waste Kings are priced less compared to InSinkErator, yet the extra bucks that you pay are for the strong making and durable design of the product. Operations of both the brands and just the same, they work wonders with food wastes. These units are going to sit under the sink like silent monsters and engulf each and every form of kitchen waste. Waste King’s price is certainly competitive, but InSinkErator is a premium deal too. When high on budget and are looking for an appliance that will meet heavy disposal needs of your home then InSinkErator, otherwise Waste King can truly be value for money. Which is a better garbage disposal brand: Waste King or InSinkErator? There is no definite answer to the above question. It depends entirely on what you want. if you are looking for an entry level model which gets the job done go for Waste King. If you are looking for top-notch disposal with all features and looks you will find one among InSinkErator models. Both InSinkErator and Waste King have a number of models starting from economic to premium. Both of them have their pros and cons which you read in detail above. Both brands are very reliable so you are making the right decision if you buy from any of them. Use our comparison tool if you have something specific in mind.